My goal was to arrive at a card design that would enable my DD to assist in the process, given her limited physical abilities. I wanted the ornament to be a part of the design, and fiddled around with a few different methods for hanging it on the card, but in the end the simplest solution was the best one, a small slit in the top edge that would hold the yarn hanger. I used a number of things that I had on hand and that haven’t seen the light of day in ages. – plain white untextured card blanks. I bought them on sale, on a whim, and haven’t used one yet. – Making Memories magnetic stamps. They only go up to 2009 for the year stamps, but had all the numbers so I was able to combine the Christmas word and the year on the magnetic holder to stamp as a unit. I figure DD can stamp them a bit spread out on a shee of white card and I can then punch them so they are centered. – Hero Arts Christmas words background stamp. NO idea when I got this but it must be 15 years ago. Don’t think I have ever used it. -Kaleidacolor ink pad, variegated greens. Used this one a lot, but not since I got my Distress inks. – PM adhesive stones, the little stars that are on there. I’ve never had a use for the stars (or the hearts for that matter) but this is a good way to use them up! I think I have tow or three that have nothing but the teeny round ones, the stars and the hearts left. So there you have it. Simple, cute enough for kids, and basically at no additional cost at all. If I cut the slit, with help DD can hang the ornament and she can do some of the stamping and sticking as well. She might manage the background stamp if I set each one up with a stamp positioner but I may have to accept that some of them will be slightly wonky. It may not be the most elegant of cards, and it’s still so dark and gloomy here not brilliant photography, but it certainly hits all the requirements. 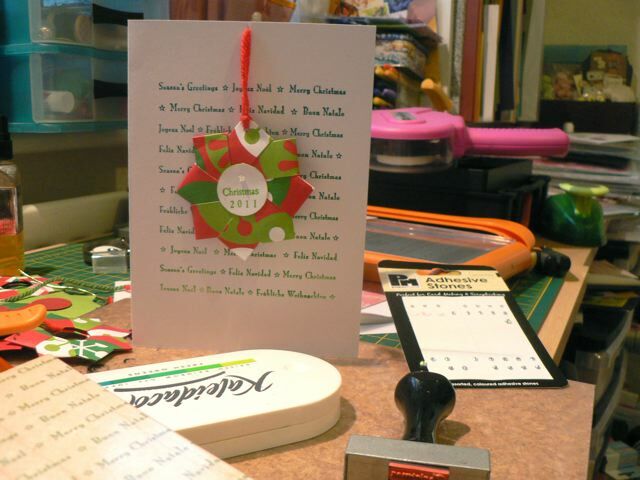 I can even set up a printing press stamp set I have to let DD stamp For Your Tree, from me or something like that, for the inside. That way she feels part of the process and can say she helped make the cards. I think she’ll enjoy that. Now back to tidying up in preparation for ANOTHER visitor for a few days, then blissful peace. 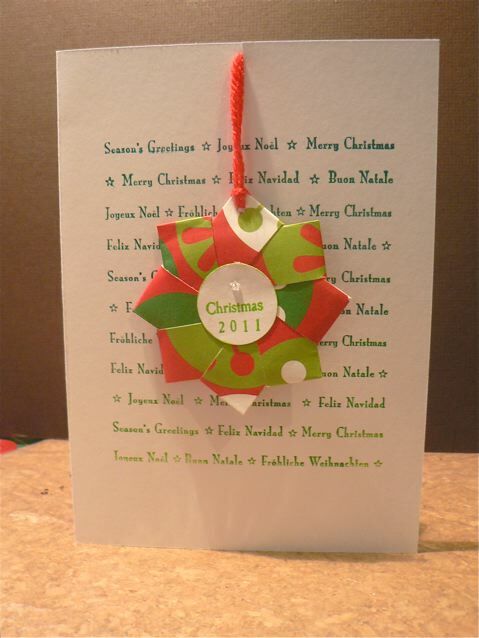 Categories: cards, Christmas, stamping | Tags: cards, Christmas, origami, stamps | Permalink.